This post initiates what I hope will be a long series of articles about sustainability and its importance to the wine industry specifically, and farming, in general. I am fortunate to work for Jackson Family Wines, a leader in the sustainability movement with a longstanding belief in protecting the land for future generations, and a pioneer in sustainability initiatives. In striving to understand sustainability and its importance, it helps to start with a definition of sustainable farming and a comparison of the four winegrowing systems in the United States: Conventional, Sustainable, Organic and Biodynamic. Take from the earth only what it can sustainably provide. A broad category, sustainable farming includes agriculture, economics and worker relations. It values the Triple Bottom Line of environmental health, social justice, and profit for the farmer. While no legal definition exists, sustainable farming is guided by the principle of meeting the needs of the present without compromising the needs of the future generation. Conventional vineyard farming allows the use of agricultural chemicals such as herbicides, pesticides and fungicides, while conventional winemaking may use a broad variety of inputs, from cleaning agents to wastewater processing adjuncts. Unlike European governing organizations such as the AOC system in France, American AVA laws only establish regional boundaries and varietal percentages and do not govern vineyard and winemaking practices. There are a variety of regional, state and national regulations, but no unifying regulator. For example, the DPR (Department of Pesticide Regulation) oversees the use of pesticide applications, but the EPA regulates vineyard practices relating to environmental concerns such as endangered species and erosion. Sustainability employs the triple bottom line approach of environmentally sound farming as well as responsible economic and social practices–a whole system that considers a company’s impacts on ecological and human resources. Sustainability programs encourage landowners to measure and reduce their footprint beyond the farm. They enhance transparency in accounting for impacts like water and energy use, integrated pest management, and worker health, and require continuous improvement year over year. Third party auditors independently verify conformance. Each certifying organization has its own set of guidelines that enhance transparency and require continuous improvement year over year. 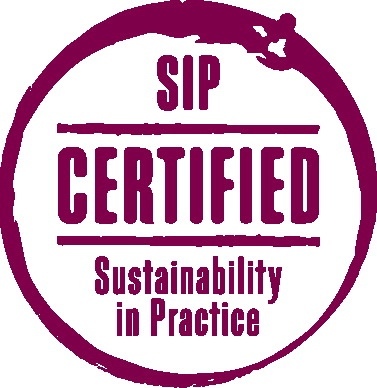 Common certifying bodies include CCSW (Certified California Sustainable Winegrowing), SIP (Sustainability in Practice) and LIVE (Low Input Viticulture & Enology). In the US there are two types of organic labeling that are used for wine: “Certified organically grown grapes” (which may use sulfites in the winemaking process) and “Organic” (which may not use any sulfites in the vineyards or winery). GMOs are strictly prohibited. No addition of synthetic compounds in the vineyard, such as herbicides, pesticides, fungicides or fertilizers. Organic wines must be made with organic grapes and vinted without any added sulfites. No synthetic clarification agents may be used in fining. The USDA (US Department of Agriculture) oversees organic certifying bodies for wine in the US. The most common are CCOF (California Certified Organic Farmers) and Oregon Tilth. In many states, however, there is no organic certifying body, so producers seeking Organic labeling are certified by the USDA. Wines farmed according Biodynamic principles (a spiritual-ethical-ecological approach that accounts for tangible and intangible forces) and vinted without the addition of any adjuncts in the cellar. GMOs are strictly prohibited. Biodynamic agriculture views the farm as a holistic living organism; an ecosystem complete with animals and composting. Practices follow lunar cycles and employ nine naturally-derived “preparations.” Biodynamic certification does not allow the addition of yeast, acid or sugar in the cellar, but sulfites may be used. In the United States, Demeter (Demeter Association, Inc.) is the certifying body for all Biodynamic wineries. The primary international certifying body is known as DI (Demeter International). Now that we have a definition of sustainable farming and an outline of winegrowing systems in the United States, we can dig deeper into sustainability and its importance to winegrowing. I welcome your comments and input. ~ by Thomas on January 4, 2015.